Emperor of Brazil; born Dec. 2, 1825; died at Paris Dec. 5, 1891. He succeeded his father, Pedro I., and assumed personal control of the government in July, 1840. The last years of his life were spent in exile after his deposition (1889). 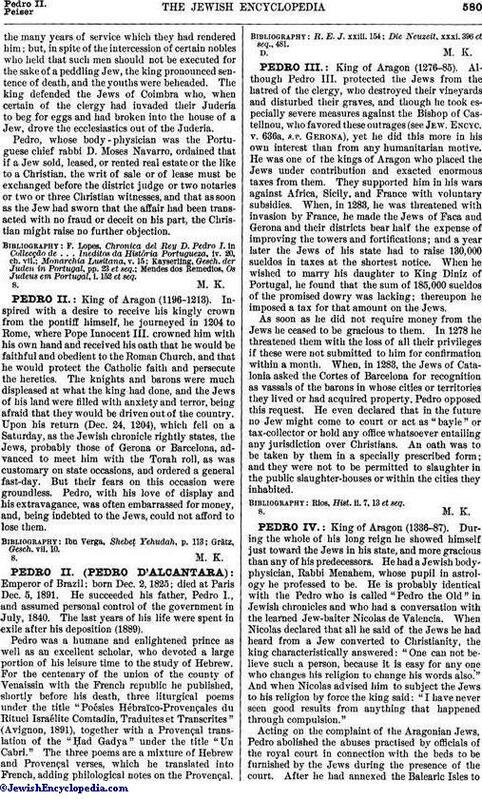 Pedro was a humane and enlightened prince as well as an excellent scholar, who devoted a large portion of his leisure time to the study of Hebrew. For the centenary of the union of the county of Venaissin with the French republic he published, shortly before his death, three liturgical poems under the title "Poésies Hébraïco-Provençales du Rituel Israélite Comtadin, Traduites et Transcrites" (Avignon, 1891), together with a Provençal translation of the "Ḥad Gadya" under the title "Un Cabri." The three poems are a mixture of Hebrew and Provençal verses, which he translated into French, adding philological notes on the Provençal. Die Neuzeit, xxxi. 396 et seq., 481.